Using Microsoft Windows and having Ctrl + W to close the current window/tab in Notepad++, I was looking for a similar shortcut to close all documents/windows/tabs at once. But these are a lot of clicks/keys to press. In addition, I could simply hit Ctrl + W and keep my fingers on the keyboard until all windows are closed. Again this feels kind of a hack to me. Is it possible to configure Notepad++ to close all open documents with a single keyboard combination? 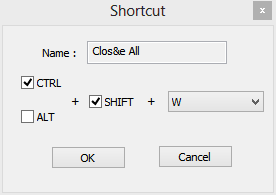 This is a common keyboard shortcut to Quit in Windows. It is not standard across other operating systems, like CTRL+W to Close. I think it was inherited from a popular MS-DOS application, like WordPerfect. 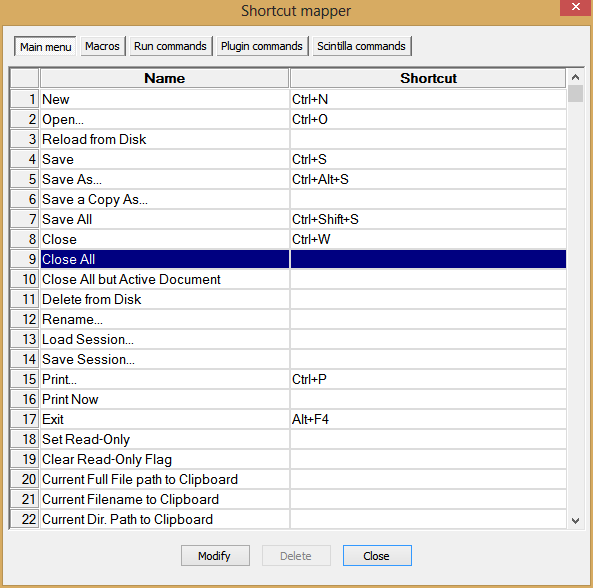 No, not any shortcut to close all tabs/windows in a sudden for Notepad++. Not the answer you're looking for? Browse other questions tagged windows keyboard-shortcuts notepad++ shortcuts or ask your own question. Does Notepad++ have an “unclose” command? Is there a Windows keyboard shortcut to quit Firefox?